My husband LOVES a good steak. He likes is "rare rare rare no whinney". That is how he orders it. Even though I am a veggie, fish, and poultry kinda gal, I still make the effort to make him things he loves. Romantic Tip: Take the time to do something just for your love. One of the great ways to show your love for someone is to do something for them, even if it isn't something you would want. It let's them know you care about them enough to step out of your comfort zone to make them happy. 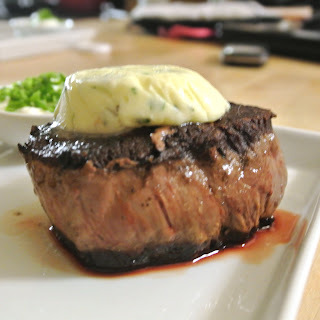 Recently I was blessed to recieve some Buttery Prime Angus Filet Mignon from Certified Steak and Seafood Company. If there was ever a steak that you will believe can “melt in your mouth” the Certified Steak and Seafood Prime angus Filet Mignon is it. With a delectable almost sweet beef flavor, and a strong buttery undertone that only Prime angus offers, it has to be tasted to be believed. A word from Certified Steak and Seafood Company: "Our commitment to our customers is simple: Offer the highest quality products at the best price and back it with a 100% guarantee. We source directly with no 'middle man' making our supply chain the shortest in the industry. This allows us to maintain the highest quality standards all the way to your plate. On top of this, we sample all products at the moment of final packaging and have a world-renowned laboratory test for various types of adulteration or contamination. This ensures that the food you purchase from us is pure and safe." 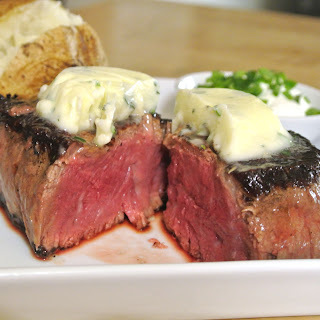 A little more about the Company: Certified Steak and Seafood Company was formed by the three Frisch boys, Mark, Adam, and Steven; all of whom thought that everyone should be able to buy the highest quality steaks and seafood direct. The brothers experience comes from a three generation family owned wholesale company that is one of the largest seafood importers in America. Now through February 28th you can get $25 off your entire order by using the following coupon. 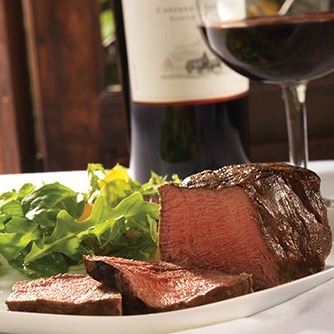 You can like Certified Steak and Seafood on Facebook here. You can also follow them on twitter here. After you get your amazing steak, you can make this great recipe. 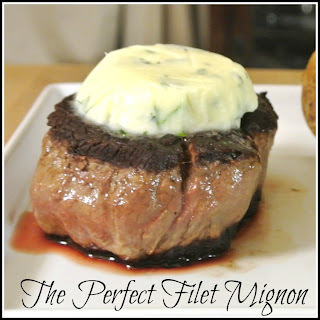 It is the definition of the perfect filet mignon. My husband says he starts drooling whenever I even mention it. This is his favorite recipe. Take 1/2 stick of butter, softened, and mix well with the peeled, chopped garlic, the chopped herbs, and the lemon zest. Form into a log and refrigerate. Generously season the filet’s with salt and pepper, approximately1 teaspoon of seasoning per side. Heat the remainder of the butter (1/2 stick) and the olive oil in a cast iron skillet on medium high heat. Preheat your oven to 400 degrees. 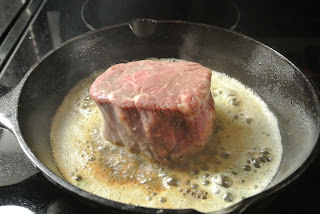 Sear the filets in the hot pan for about 2 minutes per side, or until a nice brown crust has formed. While the steak is searing, continue to spoon the residual butter in the pan on top of the meat while it’s cooking. Once both sides are seared, place in the center of the oven for about 6-8 minutes, depending upon how thick your steak is. In the last minute of cooking, take the log of compound butter and slice a nice thick piece to place on top. Let rest for 5 minutes before you cut into it. This lets the juices flow into the meat instead of get all over your plate.